As promised, Warner Bros released another TV spot for the much-anticipated 'Wonder Woman' movie starring Gal Gadot and directed by Patty Jenkins. The one-minute spot appeared during Fox's 'Gotham' Monday night and it featured some new footage and captured some lighter moments. Whenever Etta Candy (Lucy Davis) is on screen with Diana Prince (Gadot) there's some humor that feels natural as Diana plays the straight man to Candy's comedic foil. There's also some more footage of Diana as a child and more action sequences during WWI. As the trailers begin to stack up, 'Wonder Woman' looks better and better revealing a balanced and complex vision from Jenkins with Diana caught between two worlds. 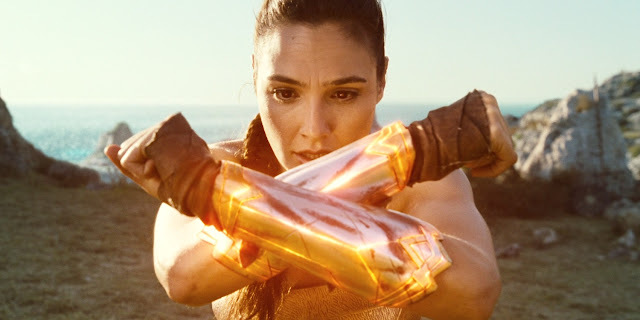 Directed by Patty Jenkins and written by Allan Heinberg and Geoff Johns from a story by Heinberg and Zack Snyder, Wonder Woman stars Gal Gadot, Chris Pine, Connie Nielsen, Robin Wright, Lucy Davis, Danny Huston, Elena Anaya, Saïd Taghmaoui, Ewen Bremner, Lisa Loven Kongsli and David Thewlis.